SUPERVALU HAS RETURNED to the position of Ireland’s most popular supermarket, but Dunnes Stores and Tesco are right behind it. The latest Kantar supermarket shares show that SuperValu accounted for 22.3% of the consumer spend over the course of the 12 weeks to 22 April, making it the country’s most popular supermarket. Tesco came in second place with a 22.2% share of the spend, rising 6.1% on a similar period last year. Meanwhile, Dunnes Stores followed in third position with 21.9% of the market share (a 2.4% rise on a similar period last year). Bargain supermarkets Lidl and Aldi took fourth and fifth place with 11.4% and 11.2% of the consumer spend, respectively. “Over the past 12 months, Irish households have consolidated their spend, relying more heavily on their preferred retailer. 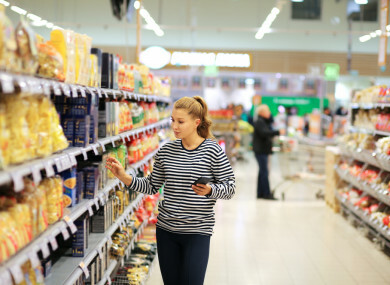 This effectively means that most of the grocers were seeing fewer shoppers through their doors,” Douglas Faughnan, consumer insight director at Kantar Worldpanel, said. “However, this period marks a notable turnaround with Tesco, SuperValu, Aldi and Lidl all attracting more shoppers than they did a year ago,” he said. Email “SuperValu is back as Ireland's most popular supermarket ... but Tesco and Dunnes Stores are right behind it”. Feedback on “SuperValu is back as Ireland's most popular supermarket ... but Tesco and Dunnes Stores are right behind it”.